Last month I blogged my saga of building a rig dedicated just for hosting virtual machines. So far I have been incredibly happy with the hardware. In the last week I've been going through the process of consolidating physical machines into virtual ones. Today I have a physical machine that acts as my (a) home AD domain controller, (b) SQL Server, (c) file share and (d) host for virtual machines. For all that stuff it works great, except it's a bit limited in size (trying to put virtual machines & a file share on 250GB requires some tradeoffs) and it only has 4GB RAM so it can only host one or two VMs at a time. I added two more drives to my Windows Home Server and moved all the files over. I've also created a virtual machine that acts as my DC for my AD and added it to the farm (after a few days I'll shut of the old machine for a few days and make sure everything is still logging in before removing it from the domain and decommissioning it for my brother. 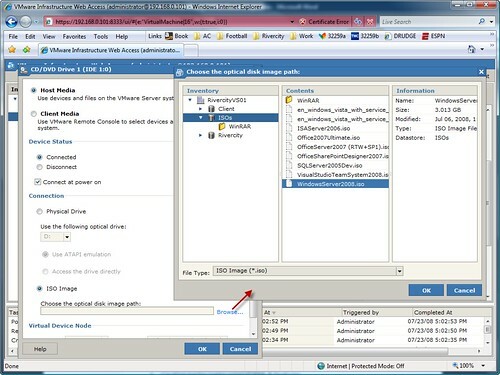 In the last post of my build out series, I mentioned I was using VMWare's free Server 2.0 RC1 (VMS2) product as my virtualization solution. I wanted to use ESX, but had trouble finding a RAID controller that ESX would recognize. I tried HyperV, but I just didn't like the administration/management story. I've had a few questions about using VMS2. So far I love it (and see that Reza does too). 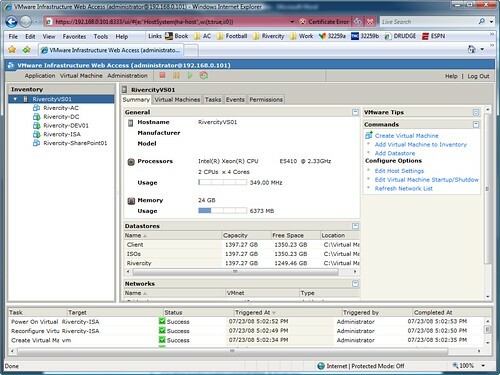 VMS2 runs on top of an OS... for me that's Windows Server 2008 Standard (x64). No it won't be as fast as HyperV or ESX because they have hypervisors that allow the VMs to run closer to the hardware, but so far I've been very pleased (in fact impressed) with the performance of my VMs. 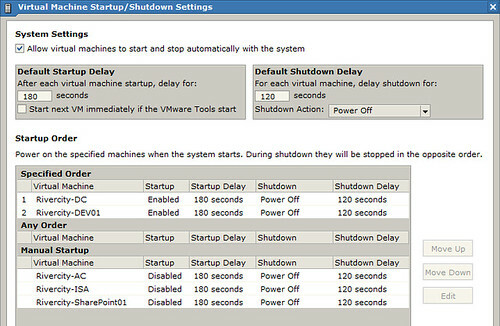 Finally it also has the ability to startup/shutdown machines in a specific order when the host machine is shut down or turned on. You can tell it to start the next one after the VMWare Tools load in the host machine, or put a delay on them. Great for me as my DC is on this one. All in all, I'm real happy with VMWare Server 2.0 RC1. Looking forward to the official release!